A sodium-vapor lamp is a gas-discharge lamp that uses sodium in an excited state to produce light at a characteristic wavelength near 589 nm. Low-pressure sodium (LPS) and high-pressure sodium (HPS) bulbs belong to the high-intensity discharge (HID) lamp family, which means that they produce light by exciting gasses and vaporized metals with electrical current to sufficiently excite them and produce light. LPS lamps are known for their very yellow or orange light, these lamps are most commonly used in certain commercial and residential outdoor applications and street lighting. High-pressure sodium lamps (sometimes called HPS lights) are quite efficient and are commonly used as plant grow lights. High-pressure sodium lamps produce a broader spectrum of light than the original low-pressure lamps. 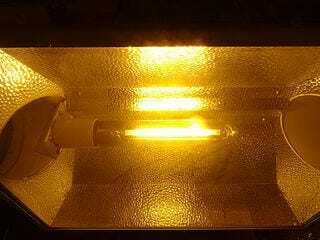 HPS lamps’ color temperatures are typically a yellowish-white light.